I posted the video of Essex's car up on You Tube a few years ago. Its just a video of the car running on the dyno, rear wheel drive. On a GT-R its pretty easy to make rear wheel drive. The safe way for an R33 or R34 is to remove the front drive/propshaft. The Nissan Skyline GT-R all wheel drive system is called ATTESA. Some ATTESA information. About 50% the comments say its a GTS, because its running rear wheel drive. About 25% ask about the lights, which I have no idea over , and the other 25% say it doesn't "sound like 1000hp." 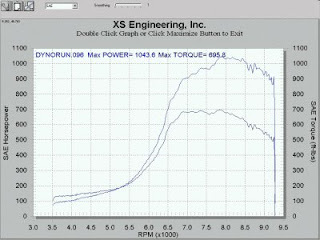 Theres the dyno chart. 1043 whp. Not too bad. I may have to chat with you sometime about legalities of these things so I can further my understanding.